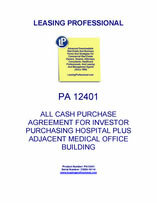 This Purchase Agreement is for a hospital and adjacent medical office building which is being acquired by an investor. The purchase price is to be paid in all cash at closing following the completion of due diligence by the buyer. The purchaser plans to lease the hospital and medical office building back to the same tenants that now occupy those facilities, but with new leases. The seller is required to furnish a laundry list of due diligence materials to the buyer as itemized in the agreement. The agreement also contains a bill of sale and assignment for personal property in the facility conveyed with the real estate, a certificate of non foreign status (FIRPTA Affidavit) and a list of all service contracts for the property included as exhibits. THIS AGREEMENT OF SALE AND PURCHASE (this "Agreement") is made and entered into by and between HEALTHCARE FACILITIES OWNER, L.L.C. , a __________ liability company ("Seller"), and HEALTHCARE FACILITIES PURCHASER, INC., a __________ corporation ("Purchaser"). Seller and Purchaser are sometimes collectively referred to herein as the "Parties". A. Seller is the owner of the Property (as hereinafter defined) which is described in Exhibit A, attached hereto and incorporated herein by reference. B. Seller desires to sell the Property to Purchaser, and Purchaser desires to purchase the Property from Seller on the terms and conditions contained in this Agreement. "Affidavit" shall have the meaning ascribed to such term in Section 4.3 below. "Bill of Sale" shall mean a Bill of Sale and Assignment in the form attached as Exhibit B hereto, and sufficient to transfer the Personal Property to Purchaser. "Business Day(s)" shall mean calendar days other than Saturdays, Sundays and legal holidays. "Certificate of Non-Foreign Status" shall mean a certificate dated as of the Closing Date, addressed to Purchaser and duly executed by Seller, in the form of Exhibit C attached hereto. "Closing" shall mean the consummation of the Transaction as provided for herein, to be conducted in escrow by the Title Company, or at such location as the Parties may mutually agree in writing. "Closing Certificate" shall mean a certificate in the form of Exhibit D wherein Seller shall represent that the representations and warranties of Seller contained in Article V of this Agreement are true and correct without exception as of the Closing Date as if made on and as of the Closing Date. "Closing Date" shall mean the actual day on which the Transaction is closed with the transfer of title to the Property to Purchaser. The Parties agree that the Closing Date shall be not later than five (5) days following the expiration of the Due Diligence Period, unless extended as specifically provided in this Agreement. "Closing Statement" shall have the meaning ascribed to such term in Section 7.1 below. "Deed" shall mean a deed containing special warranties of title by Seller in the form of Exhibit E, executed by Seller, as grantor, in favor of Purchaser (or its permitted assignee) as grantee, conveying the Land and Improvements to Purchaser, subject only to the Permitted Exceptions. "Due Diligence Materials" shall have the meaning ascribed to such term in Section 4.1 hereof. "Due Diligence Period" shall mean that period of time beginning on the Effective Date and ending on the 28th calendar day thereafter (and subject to extension as described in Section 4.1 below). "Earnest Money" shall mean the sum of $___________. "Effective Date" shall mean the later of the two (2) dates on which this Agreement is signed and all changes initialed by the Parties, as indicated by their signatures below. "Engineering Documents" shall mean all site plans, soil and substrata studies, architectural drawings, plans and specifications, engineering plans and studies, floor plans, landscape plans, and other plans and studies, if any, that relate to the Property which are currently in the possession of Seller. "Exception Documents" shall mean true, correct and legible copies of each document listed as an exception to title on the Title Commitment. "Existing Hospital Lease" shall mean the 100% net lease in place as of the Effective Date between Seller, as landlord, and Hospital Tenant LLC, as tenant, with respect to the Hospital and related Improvements. "Existing MOB Lease" shall mean the 100% net lease in place as of the Effective Date between Seller, as landlord, and MOB Tenant, as tenant, with respect to the MOB and related Improvements. "Existing Leases" shall mean the Existing Hospital Lease and Existing MOB Lease, collectively. "Fixtures" shall mean all permanently affixed equipment, machinery, fixtures, and other items of real property, including all components thereof, now and hereafter located in, on or used in connection with, and permanently affixed to or incorporated into the Improvements or on the Land, including, without limitation, all furnaces, boilers, heaters, electrical equipment, heating, plumbing, lighting, ventilating, refrigerating, incineration, air and water pollution control, waste disposal, air-cooling and air-conditioning systems and apparatus, sprinkler systems and fire and theft protection equipment, and built-in vacuum, cable transmission, oxygen and similar systems, all of which, to the greatest extent permitted by law, are hereby deemed by the parties hereto to constitute real estate, together with all replacements, modifications, alterations and additions thereto. Fixtures shall not include any trade fixtures owned or leased from third parties by Hospital Tenant or MOB Tenant. "Hazardous Materials" shall mean any substance, including without limitation, asbestos or any substance containing asbestos and deemed hazardous under any Hazardous Materials Law, the group of organic compounds known as polychlorinated biphenyls, flammable explosives, radioactive materials, infectious wastes, biomedical and medical wastes, chemicals known to cause cancer or reproductive toxicity, pollutants, effluents, contaminants, emissions or related materials and any items included in the definition of hazardous or toxic wastes, materials or substances under any Hazardous Materials Law. "Hazardous Materials Law" shall mean any local, state or federal law relating to environmental conditions and industrial hygiene, including, without limitation, the Resource Conservation and Recovery Act of 1976 ("RCRA"), the Comprehensive Environmental Response, Compensation and Liability Act of 1980 ("CERCLA"), as amended by the Superfund Amendments and Reauthorization Act of 1986 ("SARA"), the Hazardous Materials Transportation Act, the Federal Water Pollution Control Act, the Clean Air Act, the Clean Water Act, the Toxic Substances Control Act, the Safe Drinking Water Act, and all similar federal, state and local environmental statutes, ordinances and the regulations, orders, or decrees now or hereafter promulgated thereunder. 2.1 Agreement to Sell and Purchase. On the Closing Date, Seller shall, in consideration for the Purchase Price and in accordance with the terms of this Agreement, sell and deliver to Purchaser all of Seller’s rights, title and interest in and to the Property, and Purchaser shall purchase the same. 3.1 Payment of Purchase Price. The Purchase Price shall be paid by Purchaser at the Closing via wire transfer in United States currency to the Title Company to be held in escrow for the benefit of Seller, subject to any adjustments and pro-rations as described in Article VIII below. 3.2 Earnest Money. Within three (3) Business Days following the Effective Date, Purchaser shall deliver the Earnest Money to the Title Company. The disposition of the Earnest Money shall be governed by the terms of this Agreement. The foregoing, together with the Property Documents and the Phase I, are collectively referred to in this Agreement as the "Due Diligence Materials". In the event Seller fails to deliver the Due Diligence Materials or any portion thereof to Purchaser within the five (5) Business Day time period set forth above, the Due Diligence Period shall automatically be extended on a day-for-day basis by the number of days which elapse between the expiration of the five (5) Business Day time period and the date upon which Purchaser receives the last of the Due Diligence Materials.